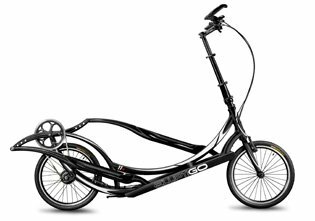 An ACE-commissioned study evaluated whether the intensity and energy cost of exercise on an ElliptiGO elliptical bicycle could attain the accepted fitness-industry guidelines for improving cardiorespiratory fitness and body composition. ElliptiGO, Inc., the creators of the world’s first elliptical bike, today announced that several members of The ElliptiGO Project turned in strong performances on the road and on the track this past weekend. On days when you can’t ride your ElliptiGO elliptical bicycle outdoors, you can use a stationary trainer to ride your bike inside or on a covered deck or patio. ElliptiGO Project athletes turned in a victory and top performances at the Boston Marathon and USA 1 Mile Road Championships this past month. Meb Keflezighi set the tone for the month with his historic Boston Marathon victory and new marathon PR of 2:08:37. The ElliptiGO Project, a group of elite athletes focused on using innovative training tools and techniques to improve performance, congratulated ElliptiGO Project member, Meb Keflezighi, on winning the 2014 Boston Marathon on Monday. The ElliptiGO Project, whose mission is to make runners faster through innovation, today announced the launch of their “PR:Initiative” (PR:I) in partnership with ElliptiGO Inc. and McMillan Running. ElliptiGO Inc., creators of the world’s first elliptical cycle, today announced their partnership with McMillan Running, an online resource providing distance runners with training plans, personal coaching and other services. McMillan Running is a leader in online training programs for runners and Coach Greg McMillan has been called, “one of the best and smartest distance-running coaches in America,” by Amby Burfoot of Runner’s World Magazine. Since the ElliptiGO workout experience itself is a combination of traditional running and cycling, our training programs for ElliptiGO elliptical bikes combine elements from traditional running and cycling training programs.